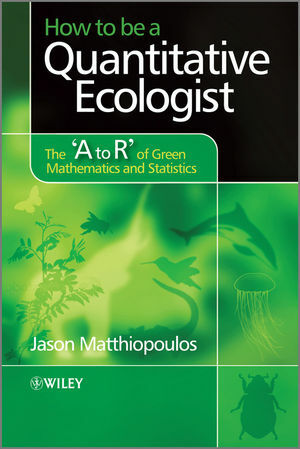 Provides a complete introduction to mathematics statistics and computing for ecologists. Presents a wealth of ecological examples demonstrating the applied relevance of abstract mathematical concepts, showing how a little technique can go a long way in answering interesting ecological questions. Covers elementary topics, including the rules of algebra, logarithms, geometry, calculus, descriptive statistics, probability, hypothesis testing and linear regression. Explores more advanced topics including fractals, non-linear dynamical systems, likelihood and Bayesian estimation, generalised linear, mixed and additive models, and multivariate statistics. R boxes provide step-by-step recipes for implementing the graphical and numerical techniques outlined in each section. How to be a Quantitative Ecologist provides a comprehensive introduction to mathematics, statistics and computing and is the ideal textbook for late undergraduate and postgraduate courses in environmental biology. "With a book like this, there is no excuse for people to be afraid of maths, and to be ignorant of what it can do." Jason Matthiopoulos, Lecturer in biology (University of St Andrews). He is a senior researcher in the Sea Mammal Research Unit and member of the Centre for Ecological and Environmental Modelling. How I chose to write this book, and why you might choose to read it. 0. How to start a meaningful relationship with your computer. 0.2 Why use R for this book? 0.3 Computing with a scientific package like R.
0.4 Installing and interacting with R.
0.9 Importing data from a spreadsheet. 0.10 Storing data in data frames. 0.11 Exporting data from R.
1. How to make mathematical statements. 1.1 Qualitative and quantitative scales. 1.11 First order polynomial equations. 1.12 Proportionality and scaling: a special kind of first order polynomial equation. 1.13 Second and higher order polynomial equations. 1.14 Systems of polynomial equations. 1.19 The graph of a function. 1.20 First order polynomial functions. 1.21 Higher order polynomial functions. 1.22 The relationship between equations and functions. 1.25 Functions of more than one variable. 2. How to describe regular shapes and patterns. 2.2 Axioms of Euclidean geometry. 2.4 Distance between two points. 2.10 Graphs of trigonometric functions. 2.12 Inverses of trigonometric functions. 2.14 Modifying the basic trigonometric graphs. 3. How to change things, one step at a time. Sequences, difference equations and logarithms. 3.3 Higher order difference equations. 3.4 Initial conditions and parameters. 3.5 Solutions of a difference equation. 3.7 Stable and unstable equilibria. 4. How to change things, continuously. 4.1 Average rate of change. 4.2 Instantaneous rate of change. 4.4 The derivative of a function. 4.9 Derivatives of functions of many variables. 4.11 Local stability for difference equations. 5. How to work with accumulated change. 5.3 Three analytical methods of integration. 5.5 Area under a curve. 5.7 Some properties of definite integrals. 5.11 Stability analysis for differential equations. 6. How to keep stuff organised in tables. 6.3 Geometric interpretation of vectors and square matrices. 6.4 Solving systems of equations with matrices. 6.8 Analysis of linear dynamical systems. 6.9 Analysis of nonlinear dynamical systems. 7. How to visualise and summarise data. 7.10 Data sets with more than one variable. 7.11 Association between qualitative variables. 7.12 Association between quantitative variables. 8. How to put a value on uncertainty. 8.1 Random experiments and event spaces. 8.5 The union of events. 9. How to identify different kinds of randomness. 9.6 Equally likely events: the uniform distribution. 9.7 Hit or miss: the Bernoulli distribution. 9.8 Count of occurrences in a given number of trials: the binomial distribution. 9.9 Counting different types of occurrences: the multinomial distribution. 9.10 Number of occurrences in a unit of time or space: the Poisson distribution. 9.11 The gentle art of waiting: geometric, negative binomial, exponential and gamma distributions. 9.12 Assigning probabilities to probabilities: the beta and Dirichlet distributions. 9.13 Perfect symmetry: the normal distribution. 9.14 Because it looks right: using probability distributions empirically. 9.15 Mixtures, outliers and the t-distribution. 9.16 Joint, conditional and marginal probability distributions. 9.17 The bivariate normal distribution. 9.18 Sums of random variables: the central limit theorem. 9.19 Products of random variables: the log-normal distribution. 9.20 Modelling residuals: the chi-square distribution. 10. How to see the forest from the trees. 10.1 Estimators and their properties. 10.3 Estimating the population mean. 10.4 Estimating the variance of a normal population. 10.7 More general estimation methods. 10.8 Estimation by least squares. 10.9 Estimation by maximum likelihood. 10.11 Link between maximum likelihood and Bayesian estimation. 10.13 Tests for the population mean. 10.14 Tests comparing two different means. 10.15 Hypotheses about qualitative data. 11. How to separate the signal from the noise. 11.1 Comparing the means of several populations. 11.4 How good is the best-fit line? 11.8 Evaluation, diagnostics and model selection for GLMs. 11.10 Fitting more complicated models to data: polynomials, interactions, nonlinear regression. 11.11 Letting the data suggest more complicated models: smoothing. 11.12 Partitioning variation: mixed effects models. 12. How to measure similarity. 12.1 The problem with multivariate data. 12.6 Nonhierarchical clustering: k means analysis. 12.8 Logistic regression: two classes. 12.9 Logistic regression: many classes. How to be a Quantitative Ecologist Visit the author's website to access problems/exercises, figures, R code, a formula sheet, errata and additional projects discussed in the book.